b) A family connection, but 9 times out of 10 not able to name the town or place where the said family reside/d. c) Cape Town: either a desire to visit it or having actually visited it (but quite often nowhere else in SA). Thus the Cape (read ‘Cape Town’) would seem to be the most prominent of South African geographical areas in the minds of English people generally. Why is this? Natural beauty is one likely answer. 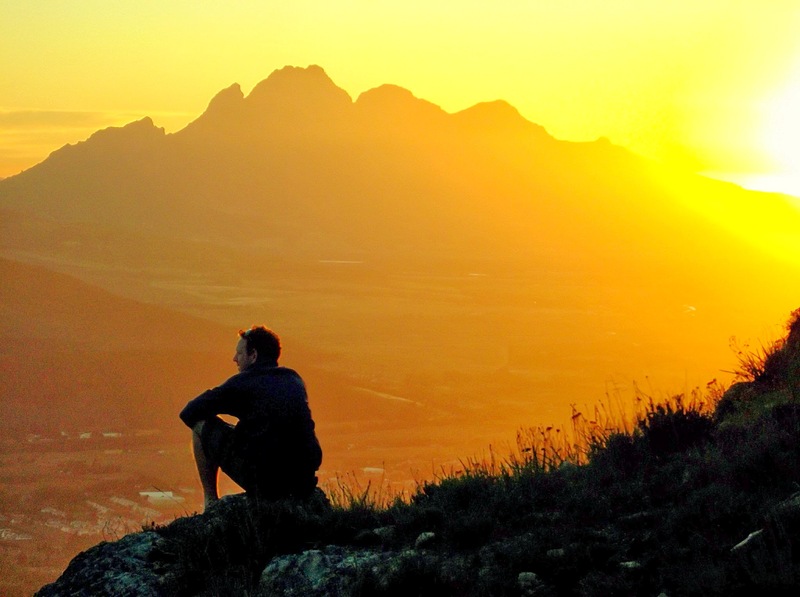 Cape Town is a beautiful town, surrounded as it is by the clear waters of the Atlantic on one side and the Indian Ocean on the other and flanked by impressive mountains. In fact the image of Table Mountain is iconic. You would be hard pressed to find someone who has not at least heard of it, never mind having seen a representation of it on a postcard, travel brochure or the television. I even learnt on my trip that it has been granted status as one of the 7 natural wonders of the world (Unesco?). And then there are the historical and cultural links. If you haven’t done so already you can read the concise but illuminating synopsis in the travelblog country information. I hadn’t originally planned on travelling to CT but an old friend of mine from Zimbabwe, John Paul, was keen to visit. He lived and worked in Joburg but had spent a year or so in CT and often reminisced about the place. He was weighing up whether or not it was feasible to return. The consensus seems to be that CT has the scenery and quality of life and Joburg has the money (as in paying jobs). JP confirmed this. He had loved his days in the Cape but had to bail out and return to the Highveld with empty pockets to start earning again. Part of the problem with CT – not that it is a problem by design – is that people like to indulge the senses. 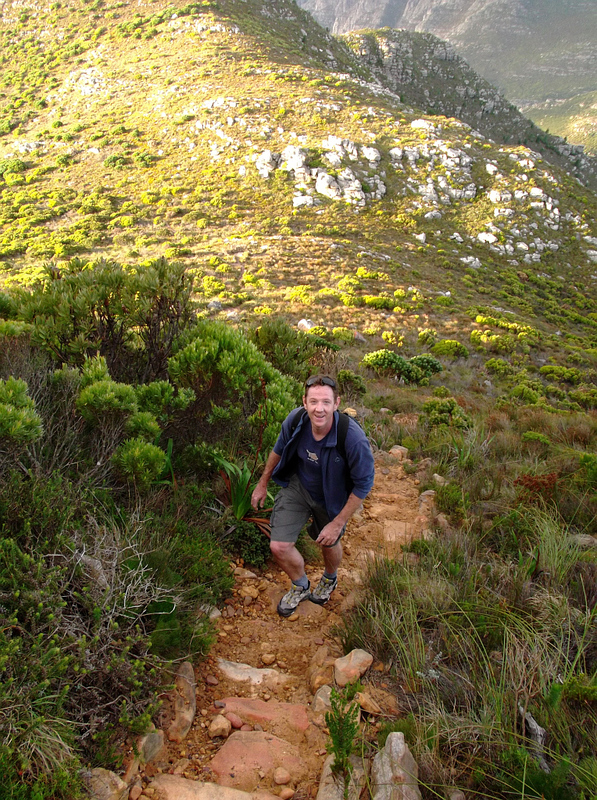 Most obviously the plethora of natural wonders and activities to suit: white, sandy beaches with crystal blue waters; towering sandstone and quartzite peaks which afford the most amazing panoramas; the diversity of the fynbos vegetation so unique to the cape region; hikes and trails; paragliding; cage diving with sharks; whale-watching etc. To complement the visual wonders are those pertaining to the palate and olfactory delights: fine wines originating from splendid vineyards set in the foothills of the mountains; superb restaurants and markets promoting good food and dining; and lots of pubs, cafes and clubs. But all this comes with a price tag, hence it is no wonder that it is a playground for the wealthy. We picked up (another) Avis hire car at the airport and made our way across to Observatory, a suburb popular with students and where a mutual friend, Sean, operated from. 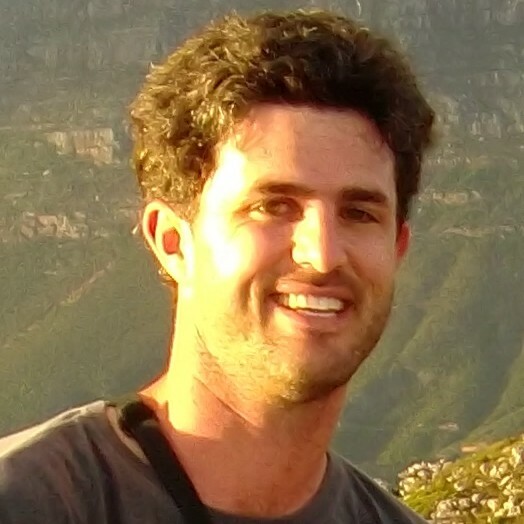 Sean was a contemporary from our St Georges College days in Harare, Zimbabwe. Sean and JP had been closer friends back then than I had been to either of them but I had become better mates with JP after school when we found ourselves together in Harare during the start of protracted turbulent times about 15 years back. Back then Sean and JP had started a business together servicing computers and whatnot and had done pretty well for themselves, judging by their local popularity anyway. Sean had moved to CT and JP had other ambitions so that business was consigned to history a long time back although I can remember seeing the metal advertising signs gathering rust in the vicinity of the business years later – the fate of most Zimbabwean business really. Now Sean ran his own adventure and tour company. JP had come on board for a period a few years ago but as I said the commercial opportunities in Joburg had pulled him back there again. Besides the adventure company he also had a bar called Forex in Observatory and a student lettings agency. Sean wasn’t in but we discovered his brother Rohan who had been a few years below us at St Georges. 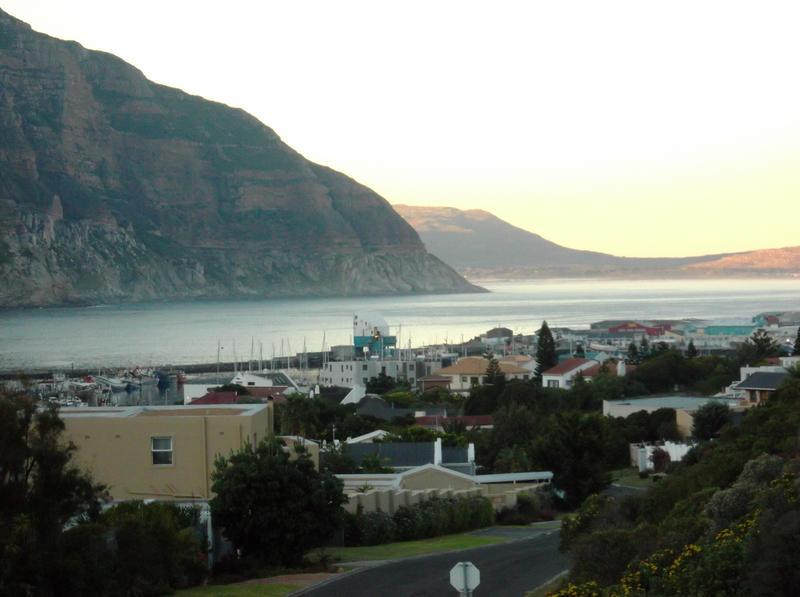 Sean was back at his place in Hout Bay where we would be spending the night. We shared a drink with Rohan and a few other locals before heading out of town going south for the half hour journey to Hout Bay. It was dark by the time we arrived but Sean welcomed us and showed us to our respective rooms. We were pretty shattered so after showering we hit the sack. As I discovered the following day Sean’s place had a great view over the bay towards the opposing mountains and Chapman’s Peak. The mountains were skirted by a road of the same name and part of the annual Cape Argus Cycle route. Sean shared his rented accommodation with several lodgers: Martin, a Dutch intern; Lisa, an American girl also working for Sean in some capacity and Chloe, a local girl studying law at CT University. I also became acquainted with Legend, his muscle-bound pitbull terrier. Initially terrified I had become quite fond of the hound who shared a sofa with me later in the weekend and proved a good companion on walks in the area. Sean’s place would be our base for the following 4 days whilst we came and went to other locations. 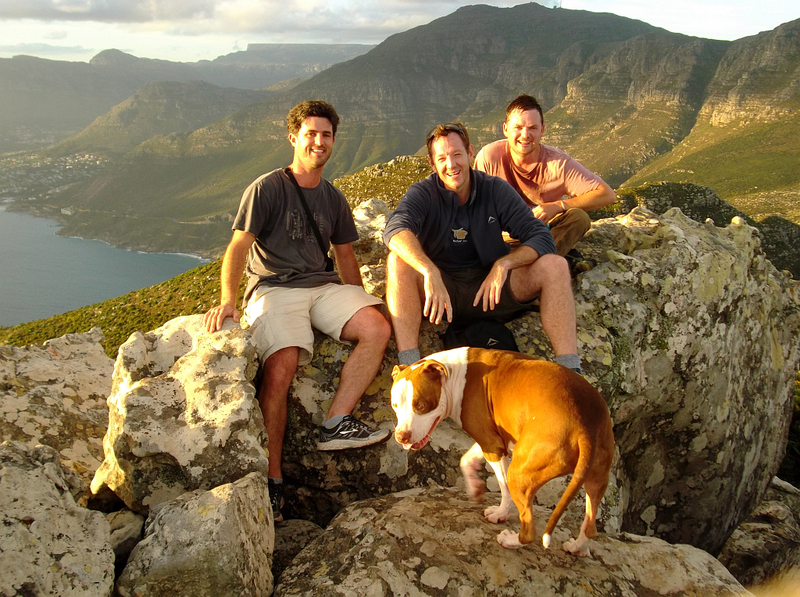 The following day we drove the Chapman’s Peak drive to Noordhoek beach with Legend in the back seat. 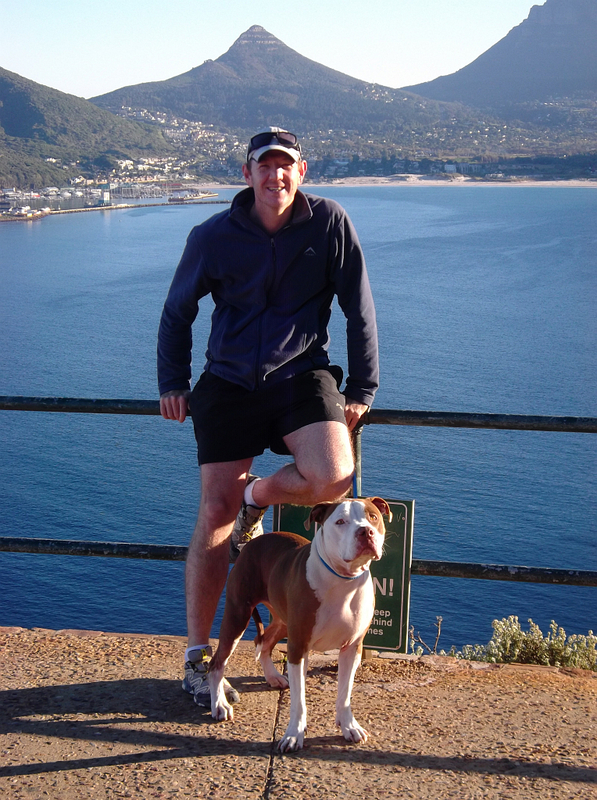 The three of us took a leisurely run along the length of the beach – perhaps a mile long – along white sands onto which the Atlantic waters gently lapped. I guess the flanking coast sheltered this stretch of water from the breakers although at the northerly end there was a break popular with body-boarders. They weren’t out at that time but we did come across a number of other joggers and dog-walkers. Towards the southern end of the beach was an old wreck, the metal ribs of the ship poking through the white sands like the carcass of some old leviathan of the deep, stranded many years before and left to decay. An old iron forecastle and rudder alluded to its true identity, the metal itself peeling away like the layers of an onion, something I had never seen before. It was very photogenic but I didn’t have my camera on me so the moment remains only in my mind’s eye. Towards the southern end of the beach was an old wreck, the metal ribs of the ship poking through the white sands like the carcass of some old leviathan of the deep, stranded many years before and left to decay. An old iron forecastle and rudder alluded to its true identity, the metal itself peeling away like the layers of an onion, something I had never seen before. It was very photogenic but I didn’t have my camera on me so the moment remains only in my mind’s eye. A little later we collected JP’s housemate, Cliff, who had also flown down from Joburg the previous day. I hadn’t been aware of it but this was another reason why JP had decided on CT that weekend. Cliff and his girlfriend were going to a wedding in Fransschoek, a town set in a picturesque wine-growing region of the Western Cape about an hour out of Cape Town. We arrived around lunch-time. I was introduced to Fi, Cliff’s partner, and another couple, Toni and Tony. My middle name is Anthony, so sitting on the same side of the restaurant table we were effectively the three Tony’s! I won’t bore you with the trivia except to say that Fransschoek is a beautiful place. 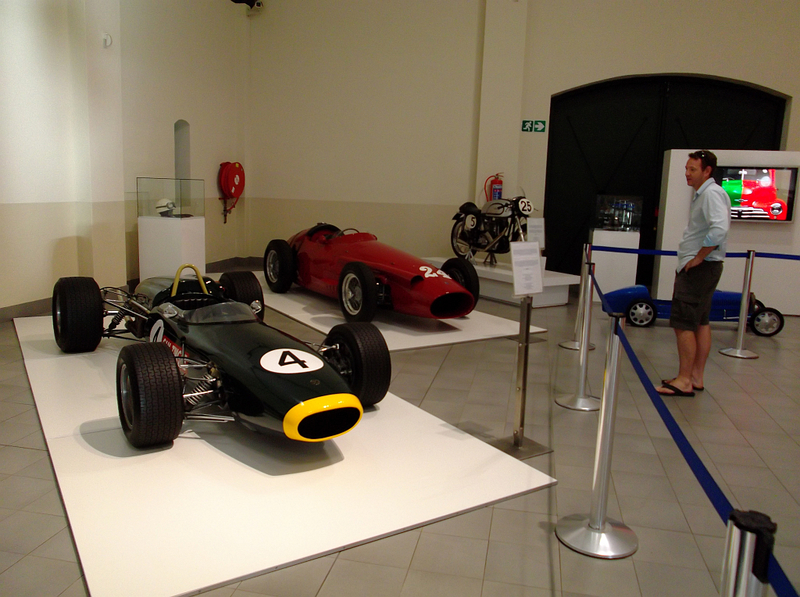 The popular Motor Museum near Fransschoek Town. After lunch, on Cliff’s recommendation, JP and I visited the local motor museum, a priceless collection of sports and classic cars and thereafter checked into a small B&B run by an elderly Afrikaans couple, Aldie and Alta, who had relocated from Pretoria (Johannesburg’s twin city, together constituting the greater part of metropolitan Gauteng Province) some years before. They spoke perfect English and operated an immaculate guest house, one wing of which they occupied. Cliff and Fi took one of the rooms whilst JP and I checked into Alta’s late mum’s place; China ornaments, polished brass and silver spoke of the old ladies former occupation. I got the impression her daughter had done little to change it really. JP found it a bit odd but I quite liked it. JP enjoys the view above town. After dark we had an engaging meal in one of the multitude of restaurants in the town. I got to chat to Fi who turned out to be a very interesting person: she had her own business consultancy and worked a lot with small business entrepreneurs in Johannesburg. That’s where her passion lay. Afterwards we had intended to turn in but landed up walking into what must have been the focus of the town’s night life, a busy little bar somewhere in the centre of town. We proceeded to have the sort of evening that for me at least only comes around once or twice a year if I’m lucky: plenty of dancing and a steady flow of drinks to keep things lively! Fi reckoned she would be regretting it the moment we walked in but I think has to be said that we all had a good time. 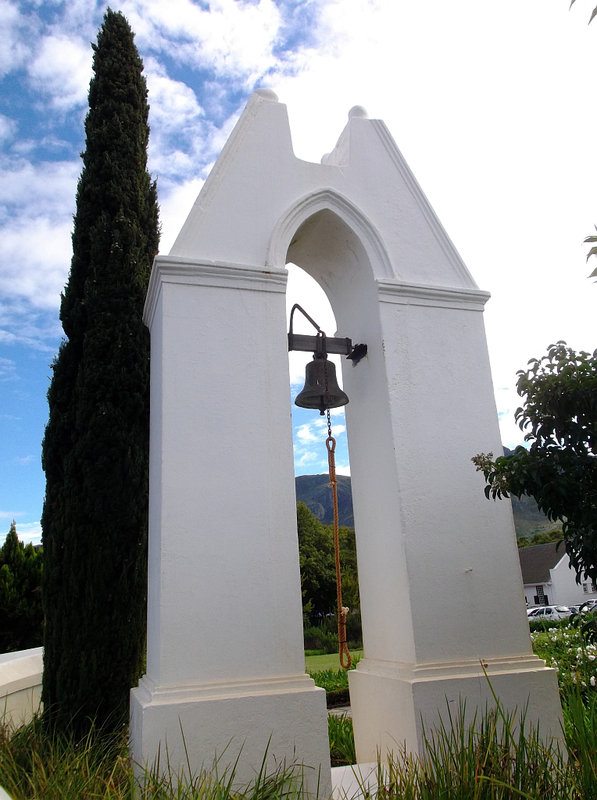 JP decided to ring the town bell on the way out which involved vaulting a small wall near the bell tower. He didn’t do this as gracefully as I think he might have intended, tearing a hole in his jeans in the process, but he rang the bell and was down the road faster than a lightening flash. We had a good chuckle about this the following day. If he had anticipated a reaction from some element of the authorities it never materialised. Perhaps this sort of thing happens quite often? JP decided to ring the town bell on the way out which involved vaulting a small wall near the bell tower. He didn’t do this as gracefully as I think he might have intended, tearing a hole in his jeans in the process, but he rang the bell and was down the road faster than a lightening flash. I felt remarkably well the next day considering all that had happened the night before. JP on the other hand was not faring so well. We checked out of our accommodation and decided to take a breakfast on the high street before going back to CT. There were several cafes to choose from and I can’t remember on what criterion we settled for the one we did, suffice to say it had a decent view of an old colonial building across the road (the town hall?) and views up and down the main street. It was mid-morning and already there was a steady flow of tourists along the pavements. We both ordered eggs, JP marrying his with a filter coffee whilst I went with an Irish (just to goad him!). 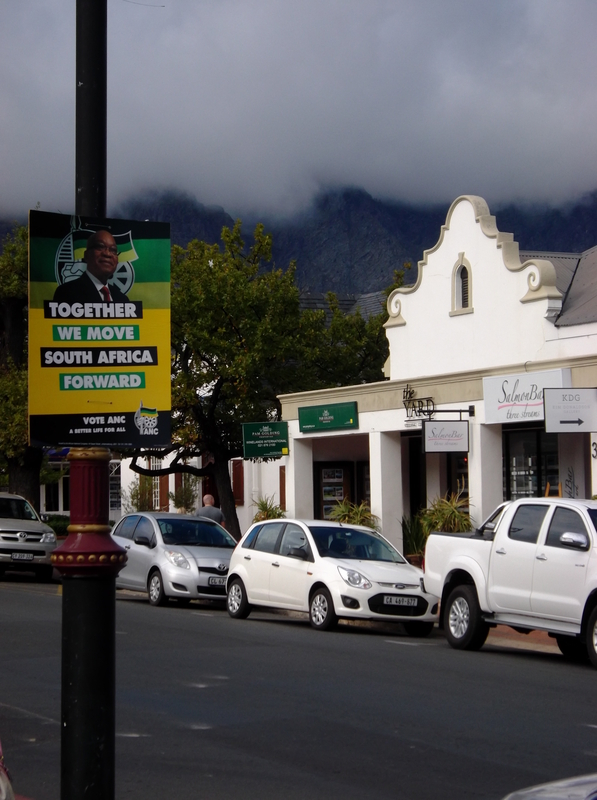 I remember taking a stroll in the interim period after placing the order and noting the election posters adorning the street lamp poles as they had done in every other town and city I had visited thus far (Durban, Joburg and Pretoria). The Western Cape was a Democratic Alliance stronghold and Helen Zille was the face of their campaign. 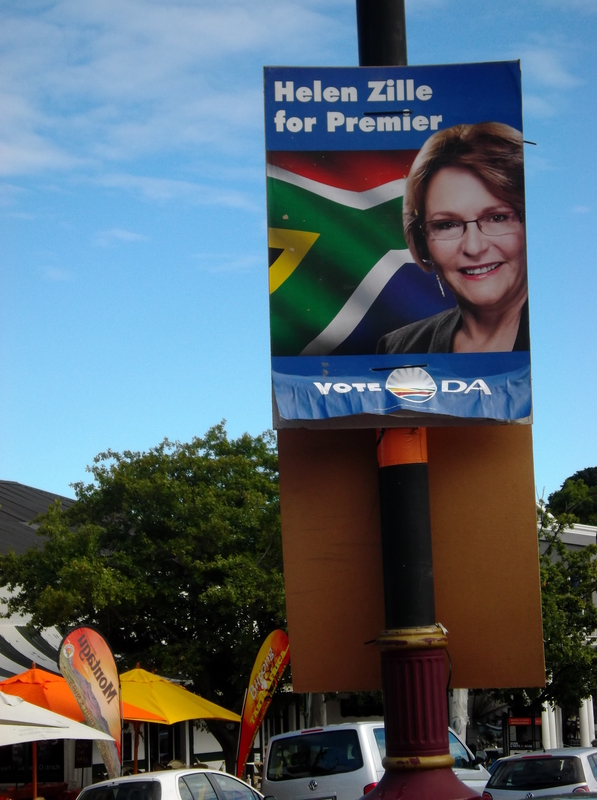 She smiled confidently from one such poster nearby which simply proclaimed ‘Helen Zille for Premier, Vote DA.’ Elsewhere their slogan was simply ‘Together for Jobs’. Like elections everywhere the economy and employment were a priority issue and considering the high youth unemployment in the country it was an obvious appeal to that swathe of the electorate. The ruling party, the ANC, opted for an equally all-encompassing slogan: ‘Together We Move South Africa Forward’, pasted below a portrait of Jacob Zuma. That word ‘together’ would seem to be a staple of South African political jargon, and no wonder really, for it is the antithesis of ‘apartheid’. If only it was as simple as everyone making a unified effort to literally move South Africa forward. Sadly there seemed to be a general consensus that corruption was systemic. Zuma was still embroiled in the Nkandla scandal in which 200 million odd South African Rand had been appropriated from the public finances to build him a residence of some magnitude. He alleged that he had not had any say in the matter (the rather large sum had been put down to ‘security costs’ I read somewhere) but it was obvious that someone somewhere had done rather well out of the deal. As it transpired our waiter was a young man named Ishmael. I say young in deference to myself because it turned out he was roughly the same age as me (not so young then!). His dark complexion and distinctive features had already alerted me to the fact the he was most likely a Zimbabwean and his accent quickly confirmed it. I soon engaged him in conversation. Ishmael was one of probably a million or more Zimbabweans living in the country. Many had papers, many didn’t. Ishmael claimed he was there on a work permit and I had no reason to doubt him. A few years before the government had made it easier for Zimbabweans to seek the right to work, although not indefinite leave to remain. He said that his permit would expire in the next year. ‘What then?’ we asked him. His response surprised me somewhat. This was a timely reminder that despite all the dirty politics and deplorable antics of the incumbent Zanu PF up in Zimbabwe, money and jobs still held sway. Besides which I had it on fairly good authority that the problem of xenophobia was still lingering not far beneath the surface. I asked Ishmael about this. He said that he was aware of the issue and how during election time things were always more tense. All the same he didn’t seem too perturbed. 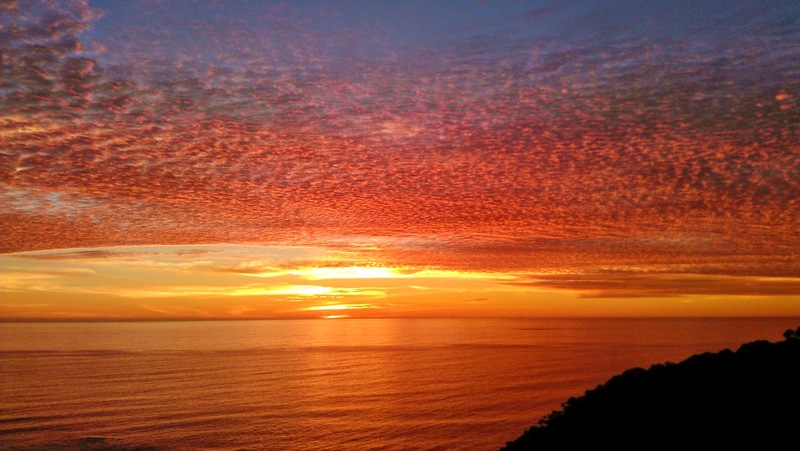 ‘Why had he come to the Western Cape?’ I asked. He replied that he had first arrived in Pretoria about ten years ago around the time I was there. I recalled the groups of unemployed Zimbabweans huddled together in suburban shopping car parks and side-streets. Perhaps he was even among them? Jobs were scarce so he had migrated a thousand kilometres or more to the south to one of the most affluent areas of the country where he found work as a waiter and hence our later meeting at this juncture in time. He still lived in what he referred to as a ‘location’, a by-word for a government mandated area of informal or formal houses inhabited by working class Africans. He didn’t elaborate on the details except to say that the blacks lived here, indicating one level, the coloureds (the lighter skinned Malays or Cape Coloureds) another level a little lower down, and the whites the bottom, by which I assume he meant the valley in which Fransschoek town was situated. Whether this could be called a system of passive apartheid by which previous patterns of settlement innocuously perpetuated itself, or something more actively enforced through cultural and economic stratification I couldn’t say, although the phenomenon is widespread throughout post-colonial Africa. Like the Zimbabwe I grew up in the whites very seldom, if ever, lived in the locations, but the blacks moved dynamically between the suburbs depending on their economic status. It was refreshing talking to Ishmael and we left him a decent tip before jumping back in to the hired Toyota for our return journey to CT and Hout Bay.